Monday, 11th August: The whole week remained dry. There were no rains. Though the sky was covered with nimbus clouds yet rains was a far cry. Lowest temperature was 23°C and highest 31°C and humidity was 69%. It seems that a short lived monsoon is over. 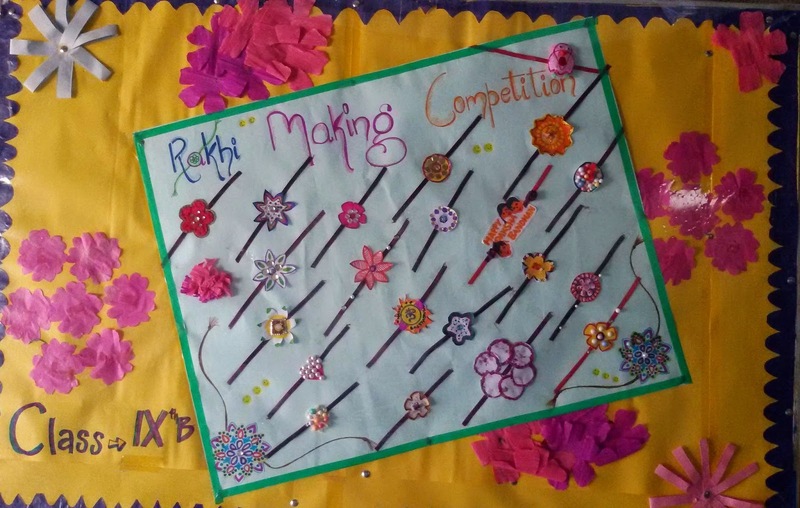 Monday, 11th August: A competition was organized on the occasion of Rakshabandhan. 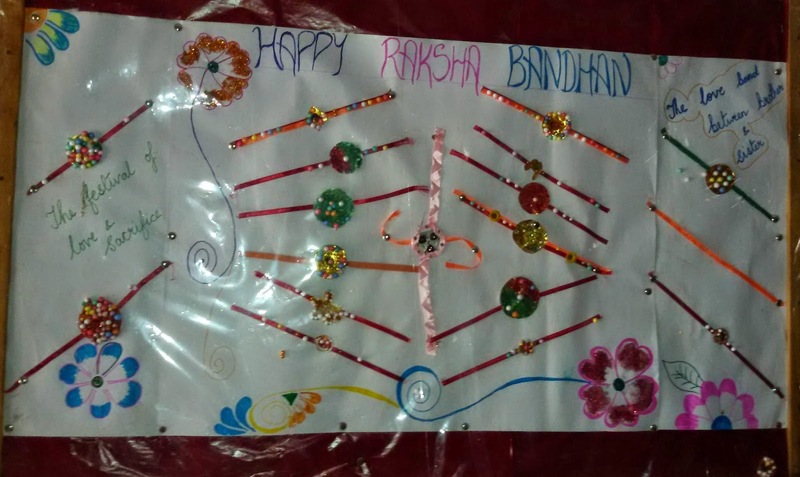 The first day of week started with a great anxiety and excitement to make the best Rakhi. But students came up with unique ideas on its creativity. Few even used waste material to make their Rakhis! The whole week they were displayed on the corridor display boards. Mr. Suresh Singh Negi (HOD Mathematics) and Ms. Prerna Rathod (Junior Supervisor) attended MathSpeak India International Conference, held on Monday, 11th August 2014 in Jaipur. The conference was a rewarding experience for them as they learnt about modern ways and means of teaching in classrooms. 126 Math teachers attended the Conference in all. Most of the teachers were from Kendriya Vidhalaya and DIET. The MathSpeak conferences are a series of annual, national conferences. This was initiated in London in autumn 2013. The conference dealt with recent developments and latest issues concerning teaching and assessment of Mathematics. The conference dealt with how we make math more interesting for our students. Connecting the math to the real life situations. Connecting the previous knowledge of students to the new knowledge. Wednesday, 13th August: Students made invitation cards for their parents to invite their parents for the Independence Day programme. Few parents turned up to watch their wards march. For the RD parade, a representative contingent was sent to Government Senior Secondary High School, Bali, to participate in the 15th August march past parade. Besides these, Aditi Adha, Lavina Singh, Puja Dutta, Silvi Mehta (Class X); Khushi Rao (Class IX); Kinjal Rao, Priyal Dave (Class VII) and Muskan Rathod (Class VIII) too went to compete in a dance category. They bagged the 3rd position. Unfortunately we failed to get a position in the parade. All participated girls were honoured in school Assembly, where Principal gave away the trophies and Rs. 2400/- cash prize that they got in the function. It has been observed by parents that our students are becoming more creative and disciplined. Thursday, 14th August: A complete rehearsal took place in the senior school for the Independence Day celebrations. While in Junior School a function was organized where classes Nursery to V sang song, recited poems, quizzed and mono-acted. Mr. Atul Bhatt was invited to be the Chief Guest and Ms. Sonal Punmiya anchored the function. Mr. Kanik Goyal and his photography club were seen actively clicking the pictures. Their work has also been uploaded on Facebook. Some teachers related the importance of Independence Day to their students during the function. Friday, 15th August: Finally the Independence Day arrived, for which the school was practicing for so long. Principal, as the Chief Guest, hoisted the flag. After the National Song, she inspected the parade. Then the whole school marched, followed by a PT display. The Academic Dean Mr. Byju Joseph welcomed the Chief Guest and spoke on freedom fighters. The Principal spoke encouraging students to understand the meaning of the freedom from mind sets now since we are an independent nations. The related examples from free from letting ones’ mind fall in the dreary sand of dead habits. Naushad Ali the Head Boy gave vote of thanks. Once the whole function got over sweets were distributed among students. They did not only get ladoos but were gifted a small flag each made by Junior School students! Once all students had left teachers had a small party of their own. Staff and students stayed back to play a friendly cricket match. In a 12 over match, teachers won the match by 21 runs, whereas students were all out for 90 in 11.3 overs. Monday, 11th - Saturday, 16th August: School celebrated Sanskrit Week. Every morning the assembly heard students and teachers speak something important about the language. Students even sang shlokas and songs in Sanskrit during the assembly.